OK, it’s like this: ever since I was diagnosed with diabetes a few years back, I have been on from one to two oral diabetes medications (metformin and Actos). When I developed kidney complications I have been on from one to two high blood pressure drugs (lisinopril and amlodipine). Even so, I’ve had to at least partially follow a low carbohydrate diet to get decent blood sugar readings. And then my latest kidney test comes along, and my kidney doctor gets to shrilly screaming on the phone to my real doctor (who’s a nurse) that I have to quit both my diabetes drug and my high blood pressure drug AT ONCE!!! and so I’m kicking the drug habit. Luckily I know about low-carb dieting as an aid in controlling diabetes. There are a lot of myths about the LC diet— that it’s a fad diet (the first diet book published was low carb, Banting’s Letter on Corpulence), or that it’s high in fat or has too much protein (actually I eat less fat, and smaller portions of protein foods, when I’m strict LC). Dr. Bernstein’s diet is a little stricter, and so I go mostly by that, though if there are foods Bernstein bans but Atkins allows (like raw carrots), I feel free to consume in small quantities if I don’t go over Dr. Bernstein’s carb limits. My blood pressure has immediately gone down to very good levels. My blood sugars are not yet great, BUT they are better than they were on pills and a half-hearted approach to low-carb dieting. I was in the mood for an ultralight breakfast this morning. 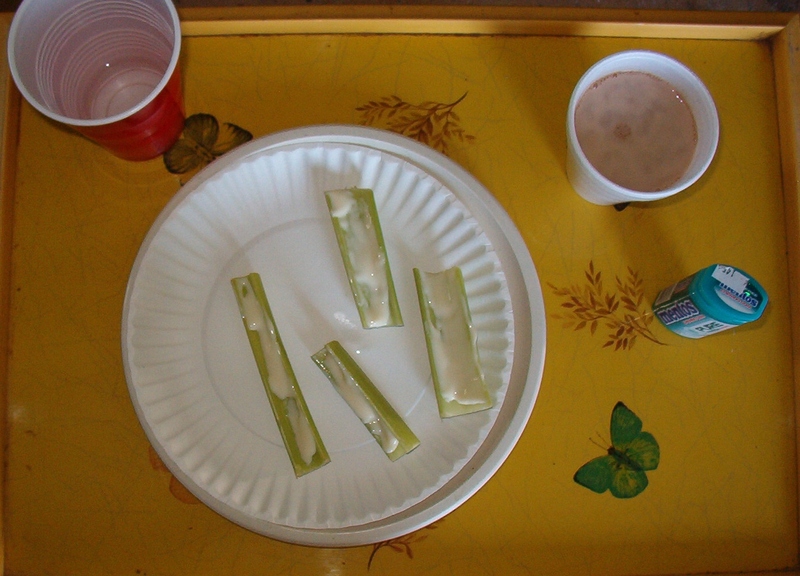 So I had some celery sticks which I spread with spreadable Gouda cheese which I bought in the specialty-cheese section of the grocery store in Menominee, MI, which is where my mother lives. I also had a cup of low-carb hot chocolate. The recipe was based on one in an Atkins recipe book. That one called for 1/3 cup heavy whipping cream, 2/3 cup water, 1 teaspoon unsweetened cocoa powder and a bit of an allowed artificial sweetener. And then you gotta put in in a pot and heat it on the stove for a bit. My recipe is easier— I make it in a styrofoam cup. Heat water up in tea kettle or whatever you use to make water for tea. In your cup, place 1 teaspoon cocoa and 1 to 2 Splenda tablets to sweeten (Or whatever sweetener YOUR preferred Low-Carb book allows). Pour about 3/4 cup hot water in cup and stir. Pour about 1/4 cup heavy whipping cream in cup and stir again. Net carbs of the original Atkins hot chocolate was 5, so this should come in at about 3-4 grams of carb depending on how much cream you use.